Lately, I’m obsessed with two things. I would like to make every recipe with these two ingredients. All new ideas that I can come up with are made out of beetroot or matcha green tea. So, this time it’s beetroot. I think you can also use beetroot powder for these protein bars. However, I found that the real beetroot works perfectly and makes sure that the protein bars aren’t dry. If you are afraid that the bars will taste like beetroot, then honestly don’t worry! It doesn’t taste like beetroot at all. You will just get a nice pink color that looks delicious and is a great idea for homemade Christmas gifts (check my post with homemade Christmas gift ideas). Beetroot is actually one of the cheapest healthy ingredients that we can find. It has so many health benefits that tell us we really need to eat more of it. Some researchers even say that it’s one of the best antioxidants. It’s good for blood pressure and cholesterol. If you are not a fan of beetroot, then I still suggest you to start eating only a little bit of beetroot at a time. Hide it in these delicious protein bars and then try to say no to that. You might even get kids to eat the pink bars. These bars don’t have to be protein bars you can always just call them pink bars when you leave out the protein. The choice is always yours. Add almonds, beetroot, protein, vanilla, and salt to the food processor. Blend. Add cocoa butter to the mixture and blend until smooth. Put the mixture in the box (19×13 cm/ 7,4x 5,1 inch) that is covered with baking paper. Decorate with cocoa nibs. Freeze for 20-30 minutes or refrigerate for few hours. Cut into smaller bars (depends on what shape you prefer) and enjoy. * You can always make just pink bars without protein, just replace the pea protein with almond meal to get the right texture. 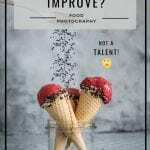 Food Photography Tips & How to Improve? Not A Talent! I saw these on your IG feed the other day and was just wowed by the color! 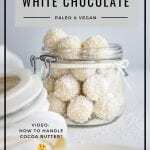 These are gorgeous and I bet they taste amazing too! So lovely! 🙂 Beetroot makes such a big difference! Awesome little video and these bars look amazing! LOVE the color! Beetroot! Of course! I couldn’t figure out your secret to this pretty pink! Those are super fun. Great color and tasty ingredients! These are so pretty!!! I love how beets make everything pink :D. I want to try these out for sure. Oh wow, those are gorgeous!! I love the color and I’m sure they taste amazing! They’re such a pretty color. Fun homemade gift idea. 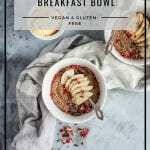 Chocolate Quinoa Bowl: Save time?